Cindy, who lost most of all her fingers following complications from a heart attack, uses this set of tools for daily eating. Cindy uses soft tubing to make everyday tools, like eyeliner, accessible to grip and turn. Engineering at Home is an unusual archive that catalogs one woman’s adaptive gear, a collaboration between Cindy, a retiree in suburban Boston, and Sara Hendren and Caitrin Lynch, professors at Olin College. It’s also a manifesto, an open call for a more expansive and capacious definition of engineering. Below are some images from the project archive and an excerpt from the project’s essay. You can read more on the project web site. A collage of Cindy’s many low tech and daily living tools, many of which she built herself, or in partnership with her family or prosthetist. 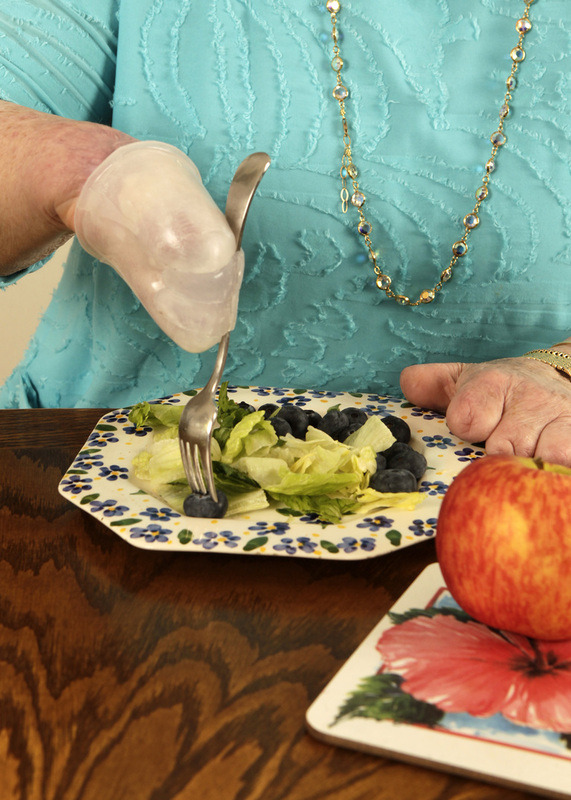 One of the transformational technologies Cindy co-designed with her prosthetist was a set of silicone caps: one for a pen, one for a fork, one for a knife. Cindy uses her fork cap for easy eating. 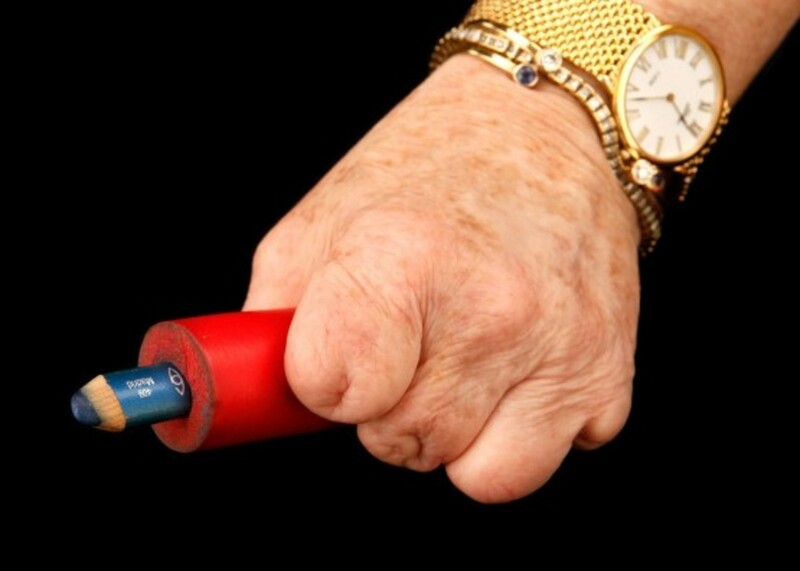 Cindy’s hand grasps an eyeliner pencil, made accessible with soft tubing. Cindy’s hand uses a peel-and-stick hook to open a jar of cold cream. “What do we learn from such a radically tailored engineering? Cindy’s story embodies the surprises and complexities of what happens in user-initiated design. * It’s something more than what’s popularly known as user-“centered” design or participatory design; it’s engineering that proceeds from the original wishes of a single end user. Perhaps especially in design for disability, attentive design-for-one practices can yield a powerful course correction to the top-down modes of manufacturing. A disposition of experimentation, a willingness to harvest the lessons of singularity, a provisional commitment to the one-off: these unique objects together form an argument for the recognition of more user-initiated technologies as engineering, wherever they originate and whatever market they may eventually find.” Read more. *That term is the coinage of researcher Jason Nolan of the EDGElab at Ryerson University.